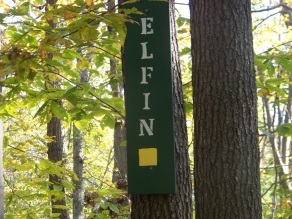 The elfin trail is one of the more interesting hiking trails of the Holbrook town forest. It is said to start off Wiggins Trail but it seems to start at the Sodergren-Mckay Entrance at Park Ave as I found the trail's markers starting at that entrance. Once it arrives at the Wiggins trail it follows to the left along with that trail. Marked by yellow squares it shortly takes a right after the initial intersection. In this picture the trail is heavily blockaded by tree blow downs from the storms of last few years. By the next season the blockading trees were removed. follow in the leafless months. often left looking for the trail. When it gets to its destination of Elfin Pond you will find yourself at the top of the pond. The trail at this point has many functions. The primary one being that it circles the pond but it also branches out and seems to have a "leg" trail at the lower end. When you reach this top of the pond section of trail if you look carefully to the left you will find a sign that points down the trail to Elfin Pond. There's an earlier mention of the Sawyer Trail that is blackened out. It will become quite obvious that this was once the Sawyer Trail and that trail has been redirected. showing a loop trail that follows a high "ridge" above the pond. This loop can be confusing to follow and you may find yourself down at the leg portion that brings you to a trail junction with the Sawyer Trail and Estes Way. Following to the right from the first sign the trail will bring you to the lower portion of the pond. 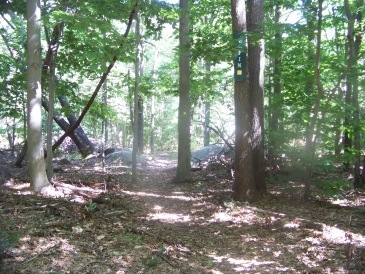 This hiking trail will then make an intersection with the Boundary trail. The two will then follow along with each other to the lower pond portion of the trail and shortly past it. 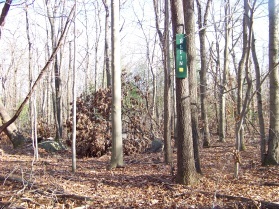 At this lower area some confusion begins as you will find an older sign that calls the trail the Madelyn Sawyer Trail. 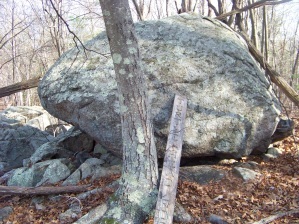 You will also pass an interesting rock named Turtle head rock. Further up this hiking trail is the portion of the elfin trail that makes matters even more confusing. There are more references to the Sawyer trail including another sign naming the trail the Sawyer Trail but no white triangles that usually mark that trail, only the yellow squares of the elfin Trail. This is also an area that the Boundary Trail exits to the right but your attention is taken by the confusing signage. The sign that shows the Boundary trail exiting is up the trail a bit but should be at the intersection with the elfin trail and showing a turn. 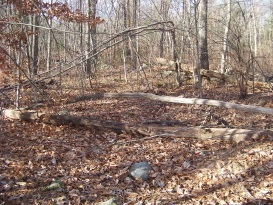 Of all the hiking trails in the Holbrook Town Forest, the Elfin and Boundary trails are the hardest to follow. Old and new blow downs that completely block the trail leaving you searching for trail blazes are a common feature. Yet these two trails are probably the most interesting aside from the difficulties. After you pass by the confusing sawyer sign these difficulties become apparent as there are many of these old and newer blow downs presently blocking the elfin trail. you will find yourself at the junction of the "other" ridge loop. A short climb up will take you to that loop. Elfin Pond is a vernal pond. The definition of a vernal pond or vernal pool is a depression that holds water that does not have an outlet. Therefore it cannot sustain a fish population. Vernal ponds usually dry up (but not always) in late summer. They are used as a breeding ground for other species that only use water during certain cycles of life. Usually these are tree frogs, something called fairy shrimp and mole salamanders. 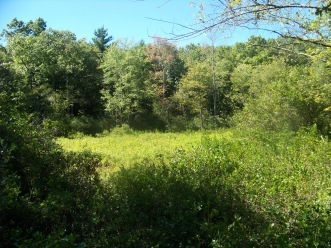 Mostly these vernal ponds are used in the spring for mating and laying of eggs. Unfortunately there is no good clearing or water edge area to get a decent view of Elfin Pond. This vernal pond looks more like a meadow in the summer. From the junction of the other loop you can either follow back to the originating part of the trail that circles the pond and return to the starting point or you can follow the "leg" portion to another junction of hiking trails. These being the Sawyer trail (the actual sawyer trail) and Estes Way. 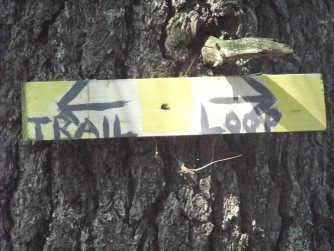 Either of these hiking trails will bring you to some portion of the Long Trail which will in turn bring you out (in either direction) to the Wiggins trail. A third option is to go back toward the pond on the lower part and find either of the entrance or exit trail portions of the boundary trail. Though from my description of this trail it may seem like much work to hike this trail, if you are that explorer at heart it will be worth the effort and a fun little adventure at that! !